The glow of the sky at sunrise looks so lovely behind the birds as we all (the birds and I!) begin our day. 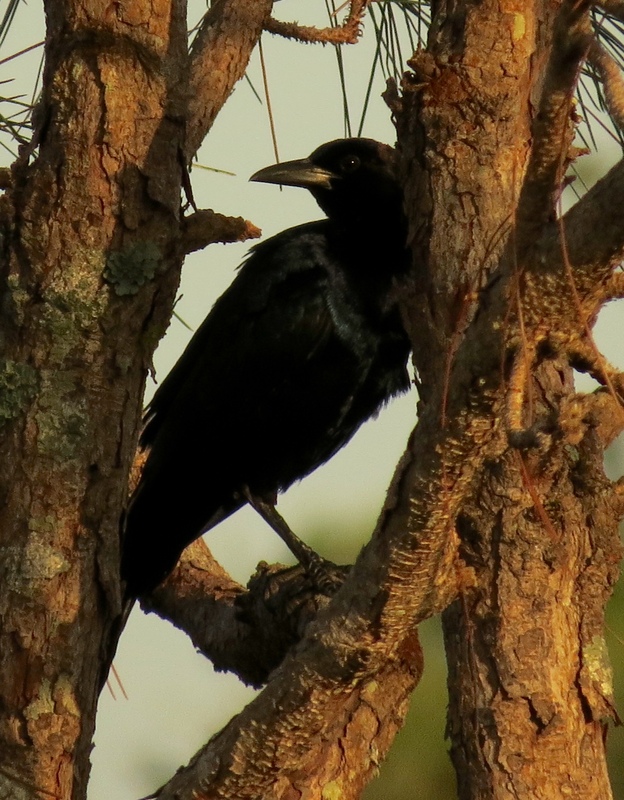 On the first several tree islands, each bird appears as a silhouette, as I walk toward them facing east..
A lone Fish Crow rests in the crook of the tree branches as the minutes pass and the world grows a little bit lighter – it’s not yet 7 am. 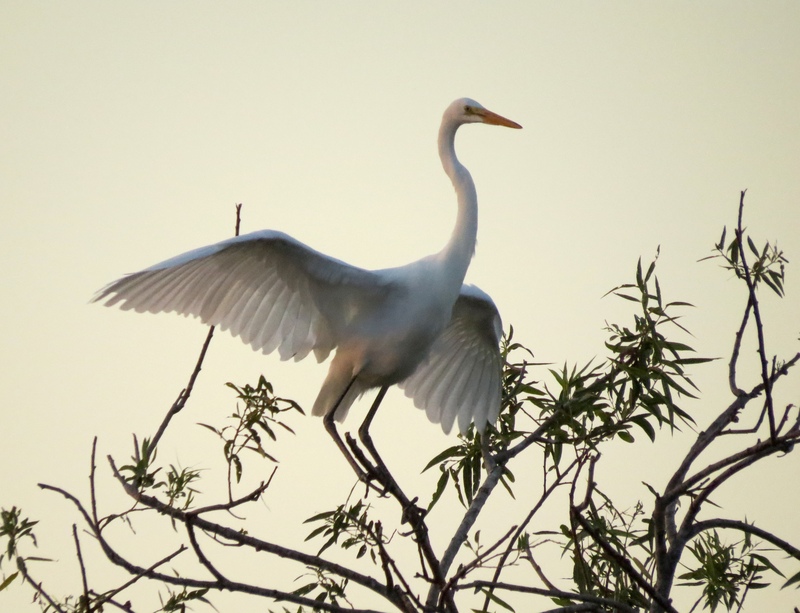 A Great Egret glides across the sky and stretches in the tree tops, touched by the soft golden pink early sunlight. 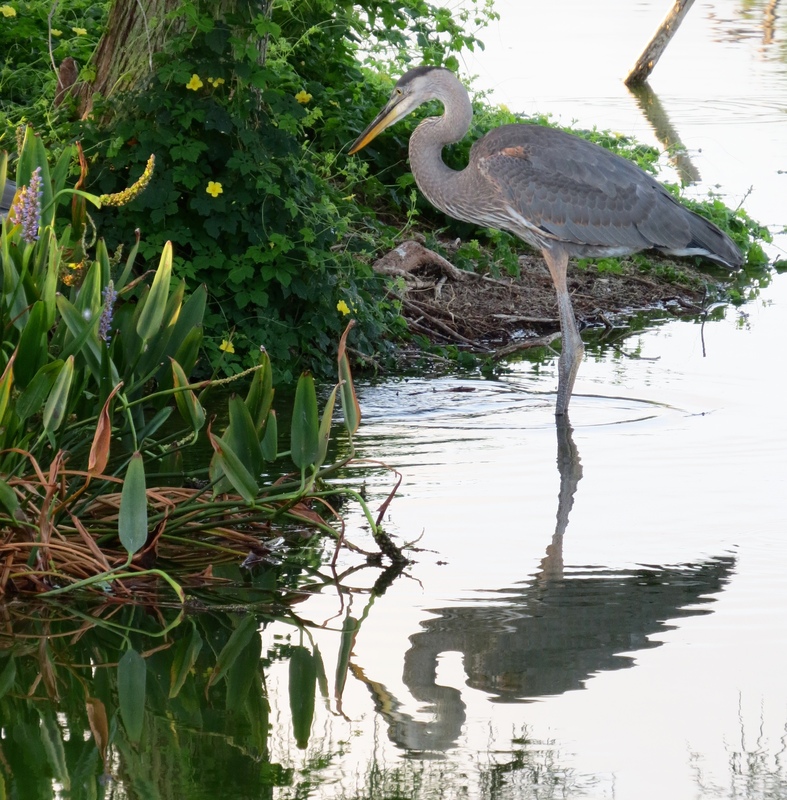 By the time I’ve walked a quarter of the way around the boardwalk, the sun is bright enough to highlight the purple and yellow blossoms on the shoreline where this Great Blue Heron is wading. No matter how tired I might be, it’s always worth it to leave the house in time to experience all of this! 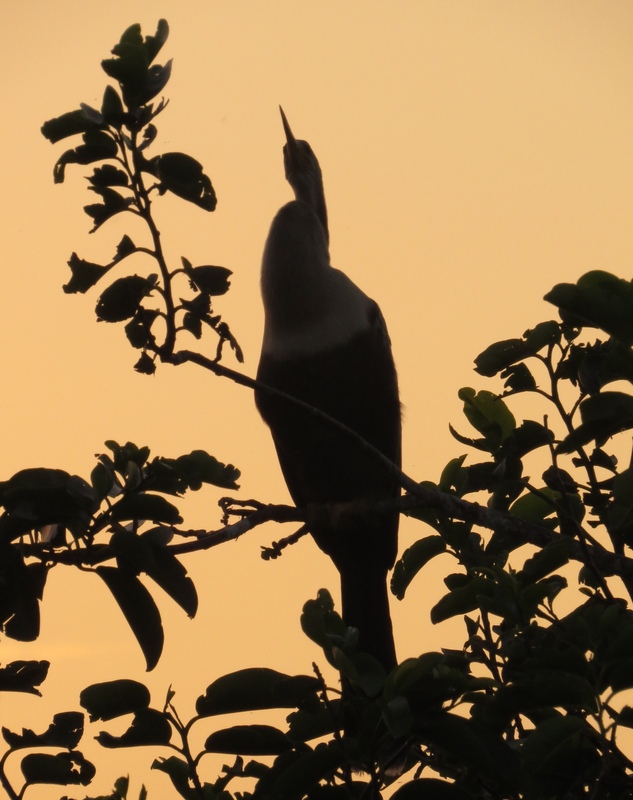 This entry was posted in Birds, Marsh/Wetlands and tagged Anhinga, Fish Crow, Great Blue Heron, Great Egret. Bookmark the permalink. « ~ just a lovely experience. It’s so worth it to be early out there, the colors in nature are special at that time! Beautiful captures. Wow, these are gorgeous!! Thanks for sharing. Majestic birds! Thanks very much Laura! Yes they are certainly incredible. I really appreciate your visit and comments! Beautiful light and peaceful moments–what a wonderful way to start the day. I was delighted to read your comments, Mike. Yes, it is a very special way to start the day. Beautiful shots. You live and bird in a magical place. You’re so right, I really DO, Donna. I always really appreciate your visits and comments! I love them all, but the silhouetted ones are wonderful! 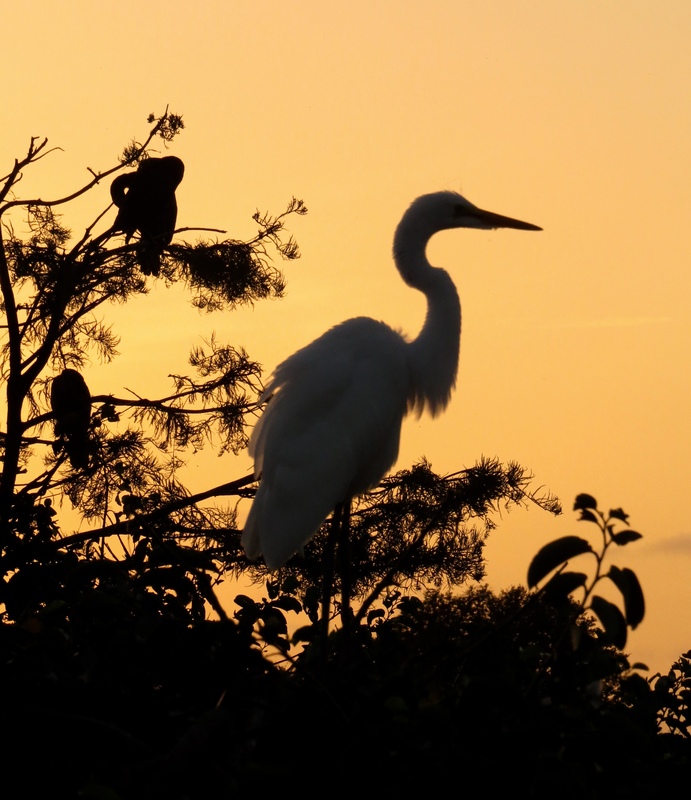 The Great Egret is lovely, the Blue Heron capture…I just love that reflection! Thanks so much, Lorri. There is something so special about the stillness of the water at that hour, and the way all of the plant life and birds are silhouetted!